We got a new bike! The logistics of transporting two kids in the city, and our love of all things bike-related, meant it was time for us to upgrade to a beloved Danish cargo bike. 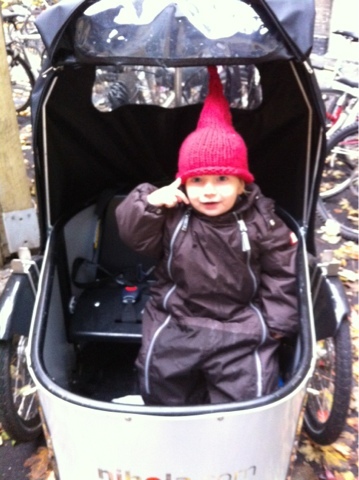 We bought a Nihola, the most popular in Copenhagen, because it turns easily and is a comfortable ride. 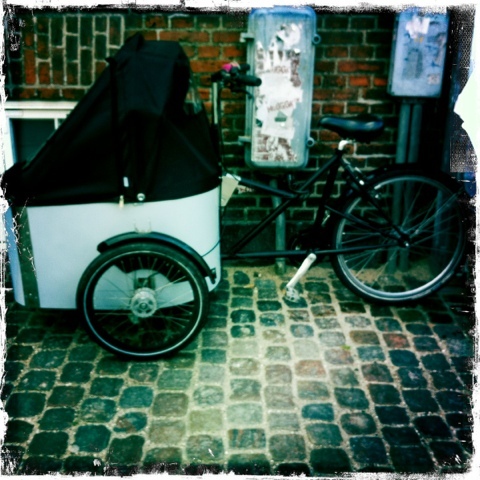 Something like 30% of all families with two or more children in Copenhagen own a Nihola. We aren't alone on the streets. They may look massive and impractical to someone not from Denmark, but here they fit seamlessly into the flow of traffic in the cycle tracks. The 7 gears and free-wheel make it easy to ride despite the strong Danish wind. The included seat can hold two kids probably up to age 12 or so, although, adults can scrunch in too. Woody sits comfortably on the seat and I put Xavier in a cushy bassinet in the bottom. A weeks worth of groceries is much easier to pick up now that I don't have to balance bags on my handle bars. It can even carry our Craigslist purchases. This is Xavier's new crib we bought from someone in the neighborhood. So easy! Felix loves the bike. The hood keeps the cold and wind out and he can happily munch a snack while watching the world go by. Very cool. That's got to be a LOT of fun to ride in. Very nice ride! I am also happy to hear your grocery shopping trips got easier! Woody looks so cute.